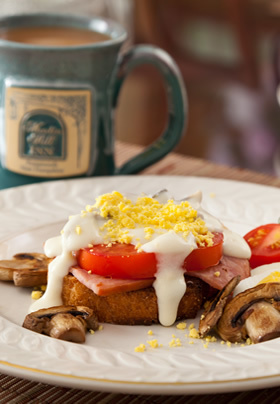 Breakfast is an essential start to a wonderful day, so at Martin Hill Inn in Portsmouth, New Hampshire, we take special care in preparing our breakfast recipes. Guests are welcome at the dining room table between 8:30 and 9:30 a.m. for a freshly made gourmet breakfast. Fresh-ground coffee and black, fruit, or herbal teas are served in mugs designed for the inn. Our recipes feature traditional New England breakfast favorites and are carefully crafted using fresh, local ingredients. We strive to serve the freshest fruits available, so the offerings vary by season. In the fall, we highlight the abundant apples of the region in several dishes including baked apples and homemade applesauce. In the winter, our baked grapefruit and poached pears are welcome surprises for our guests. The spring and summer, of course, bring an abundance of seasonal options including ripe melon with berries, honey-baked plums, and fresh peaches. In addition to seasonal items, we source our food locally when possible. All of our eggs are delivered weekly by Glen, whose egg service has been a family operation for generations. In order to provide a variety of offerings to our guests who stay for several days, we alternate our main courses between sweet and savory dishes. Some of the favorites include a garden medley quiche of spinach and sweet peppers, potato-leek quiche, and raspberry baked French Toast. When we fire up the griddle, the scent of lemon-ricotta pancakes will waft through the dining room. Russ’ special Goodnight Waffles (sometimes with blueberries, sometimes with maple bits) are a favorite with our guests. Whether it’s pancakes or waffles on the menu; the syrup is always 100% real Grade A maple syrup. Many times we have requests for the recipes for certain dishes. Our most popular offerings are listed below. Some of these recipes were developed here at Martin Hill Inn, some were graciously given by other innkeepers, and still others came from the wonderful abundance of cookbooks available out there (usually with variations or adaptations). We always give credit where it is due and extend our thanks to those cooks and authors for contributing to our breakfast repertoire. Our breakfast chef plans and prepares a daily fixed-course breakfast menu. It is always a 2-course meal, served with sides, hot and cold beverages. Our guests have described them as “legendary” and “best-ever”. For guests with special dietary requirements, such as specific food allergies, gluten-free, dairy-free, vegetarian, vegan, diabetic, or paleo, we provide alternatives as we are able. It is essential that we are informed of such requests at time of reservation. Most of the mixing for these waffles is done the night before. In the morning, just mix in the eggs, vanilla extract and a pinch of baking soda while the waffle maker is heating. Leftover batter may be covered and kept in the refrigerator for up to 3 days. Heat your waffle maker in the morning, stir the batter and have a freshly baked waffle for breakfast. The night before, or at least 8 hours before baking, combine the warm water, granulated sugar, and yeast. Let stand 10 minutes, until foamy. Stir is the warm milk,melted butter and salt. Beat in the flour until smooth; (this may be done using a hand mixer on low speed). Wrap bowl tightly with plastic wrap and let stand overnight (or for 8 hours) on the countertop. DO NOT REFRIGERATE! When ready to cook, preheat your waffle maker. For best results, after placing batter in the waffle iron, do not open during the cooking process. In a large bowl, whisk together the ricotta, milk, egg yolk, sugar, lemon zest and lemon juice until smooth. Sift together the flour, baking powder and 1/8 Tsp. salt over the ricotta mixture and stir with wooden spoon until just combined. In another large bowl, beat egg whites on low until frothy. Add remaining 1/8 Tsp. salt and continue beating eggs on high until soft peaks form. Using a rubber spatula, fold one-third of the egg whites into ricotta mixture, and then gently fold in the remaining egg whites. Pre-heat a griddle over medium heat. Water sprinkled on the surface should sizzle, but not skitter/dance. Brush griddle with a light film of vegetable oil (not butter). Spoon about ¼ cup of batter onto griddle for each pancake. Cook until bubbles form on the top, the edges look a little dry and pancakes are golden underneath. Flip pancakes and cook for 1 minute more. Yields about 3 pancakes per serving. Feel free to adjust the amount of potatoes and leeks. I’m a “lot of potatoes” guy. And if you’ve never dealt with leeks don’t try to use the dark green parts. I normally use the white and a little into the light green. I use frozen pie crust and shredded potatoes for convenience. If you want to use fresh potatoes and a scratch crust go for it. You can also prebake the crust: we don’t and it seems none the worse for it. Brown potatoes in butter, set aside. Quarter leeks lengthwise, cut into 1″ pieces, and wash thoroughly. Saute leeks in butter until soft. Set aside to cool. Mix milk, eggs, cheese, paprika, salt and pepper in a large mixing bowl. Beat lightly to combine. Mix cooled leeks into egg mixture. Use your judgment on how “leeky” you want it. Pat browned potatoes into bottom of crust. Layer should be 1/2 inch thick MAX. Pour egg-leek mixture into crust, making sure all the leeks don’t end up down one end. Peel hard-boiled eggs, cut in half lengthwise. Remove egg yolks and crumble in a small bowl. Chop cooked egg whites and set aside. Melt butter in saucepan, stir in flour and cook over medium heat about 1 minute. Add milk slowly, whisking constantly to prevent lumps from forming. Turn heat up to medium-high, cook stirring until sauce thickens to consistency of heavy cream. Add shredded cheese gradually, whisking to fully melt. Add sour cream, mustard, and sautéed mushrooms. Stir in chopped egg whites. The sauce can be made to this point and refrigerated. Warm over low heat in the morning. Toast the bread. Layer a slice of tomato and a slice of ham over the toast. Top with mushroom sauce. Garnish with crumbled egg yolks. Squeeze liquid from the artichoke hearts before chopping. 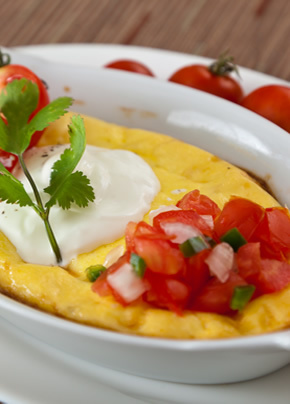 Combine eggs through oil, plus ½ cup cottage cheese with hand stick blender. Add remaining ingredients; stir well (do not use blender). Pour into a greased 10-inch pie or quiche pan. Refrigerate overnight if desired. Heat oven to 350 degrees. Cook straight from the refrigerator for 45 minutes. Remove from oven, let set 10-15 minutes before slicing and serving.